By Xah Lee. Date: 2017-03-08 . Last updated: 2018-04-19 . Things you need to know when shopping for a gaming keyboard or programable keyboard. Firmware is software that's in the keyboard's memory. It controls the device. All keyboards have firmware. The basic ones just send standard signals of the key when it is pressed. Programable keyboards have firmware that can be configured or updated. Remap modifier keys. For example, make Caps Lock send Ctrl, or swap Alt and Ctrl. Create new modifier key. For example, when Fn is held down, right hand home row keys become arrow keys. Create lock key. For example, after Caps Lock is pressed, right hand's keys become number pad keys. When Caps Lock is pressed again, the lock is released. Create key macro. That is, send a key sequence. For example, make F2 send Ctrl+c (that's “copy” for most apps.) Useful for video games or professional tasks (in image editor, word processor, video editor, etc.). Create hold key. For example, when Space is held and other keys are pressed, it becomes Ctrl combination. Note: not all programable keyboard has all these capabilities. You can remap keys or create key macros via tools for the operating system (MacOS, linux, Microsoft Windows). Plug the keyboard in any computer or operating system and it'll work 100% as you configured it. No need to install extra “driver” software. Key mapping via firmware is reliable. Because the keyboard sends the desired keycode directly to operating system. For example, say you want Caps Lock to send Ctrl. With firmware, the Caps Lock sends Ctrl directly to operating system. With key remapping software in OS, the keyboard still sends Caps Lock signal, the OS receives it, and changes it to Ctrl. When you use the keyboard on another machine, you need to configure that machine first. When system boots, it doesn't recognize the remap. For example, in Linux bootstrap console or single-user mode. In Microsoft Windows laptop bootscreen, you may need to press a key to go into bios. Firmware have different levels of power. Here's some differences. • Most gaming keyboards have pre-set actions and key-remap features. You cannot remap arbitrary keys. For example, you cannot make Space key to do Ctrl. Some keyboards have driverless programing (aka on-board programing). That is, to program the key, you just press special keys or buttons on the keyboard. No need to launch a “driver” software to program the keys. Some keyboard makers force you to have internet connection or install their driver software, in order to use the keyboard as you configured it. Usually that means the keyboard is not usable in Linux. In some cases, the keyboard does not work at all in linux, or send weird handshake characters when plugged in. Avoid any Razer or Corsair keyboards. Logitech gaming keyboards are good. You still need to install the Windows software to program the keys. (Mac version is available too) But after that, you can use the keyboard on any machine without their “driver” software. Great programable firmware need a way to program it. Graphical Software. 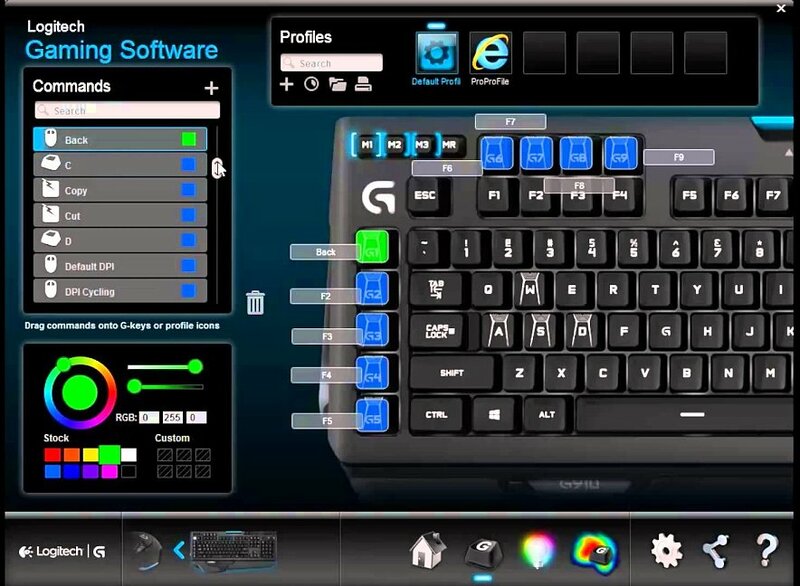 Most gaming keyboards come with a easy-to-use graphical software to program the keys. Many expensive keyboards have powerful firmware. Gaming keyboards usually focus on key macros, and profiles (which is a set of configurations, that you can switch to on-the-fly.). Gaming keyboard usually does not allow arbitrary key remap, nor creating dead keys, nor modifier key layers. Programable keyboards usually focus on arbitrary remap of keys and key layers with modifier keys. But it usually does not have profiles feature.